Carol's Theatre Reviews ~ It's Fun To Go Out: 'Tis The Holiday Reason, The Whos Are In Town through The Rest of The Season. 'Tis The Holiday Reason, The Whos Are In Town through The Rest of The Season. “How the Grinch Stole Christmas”, the animated television special, won the Peabody Award in 1997. The book, itself, was published in 1951. In 1998, Ted Seuss Geisel, San Diego’s quintessential Dr. Seuss, is alive and kicking, in living color memory only. 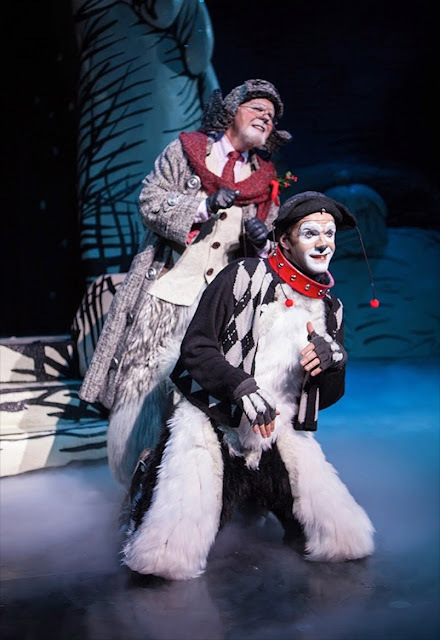 With a generous sponsorship grant of $250,000, the San Diego Union-Tribune underwrote this new ‘Grinch’ musical that the Old Globe can now boast 20 consecutive years of the mean Green Grinch who goes APE at the word Christmas! Opening night of “How the Grinch Stole Christmas” now on the Shiley stage of the The Globe through Dec. 24th was as exciting as going to a birthday party with several hundred adults and with children outnumbering the adults, dressed to the nine’s all looking forward to this magical event. I didn’t see one person, big or small disappointed in anything at all/ The all -star cast with local and visitors took no prisoners/ especially this new “Grinch” on the block whose in step lock and stock / It’s a delightful journey into Whoville and of course, the ever- optimistic’s never looking back in remorse. 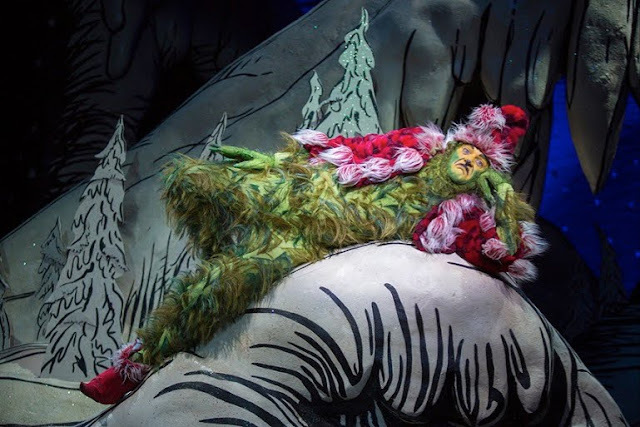 In case you missed the story: Just north of Whoville lives the Grinch (the beautifully strong voiced Bah Humbug Edward Watts), he just hates Christmas and all it’s trimmings. He thinks if he steals the presents, food and decorations of the happy folks in Whoville that he can cancel their Christmas. Much to his chagrin, it doesn’t really matter. He learns lesson later on from the every optimistic Whos, that it’s the spirit and the heart of the holiday that counts. And he learns it big time from little Cindy Lou Who, an irresistible and simply unaffected Abigail Estrella. 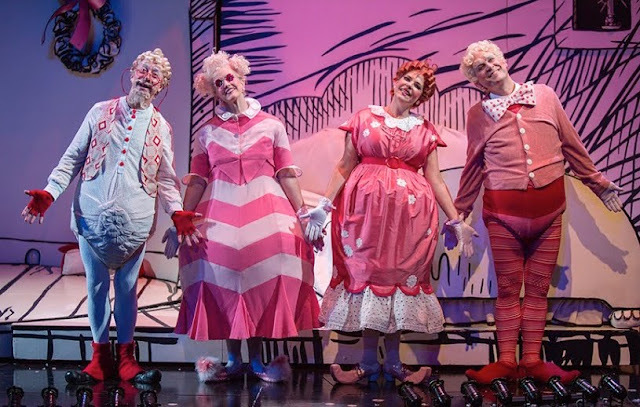 The play is narrated by the ever appealing and bright Steve Gunderson (Who)/ who has been with the Grinch and who knew/for the past 15 and so he’s not new/ to the role as Papa Who and graduated to Old Dog, Max and that’s kinda new. Young Max (Dan DeLuca), the Grinch’s one antler reindeer after a fashion, is playful and grabs lotsa attention. Bets Malone and Robert J. Townsend are Papa and Mama Who, and who could ask for a more talented two? Grandpa and Grandma Who are Larry Raben and Nancy Snow Carr a wonderful pair of elders by far. John Perry Wishchuk and Josette Candelaria are Boo and Annie Who and hopefully you get the get the picture, I hope you do! 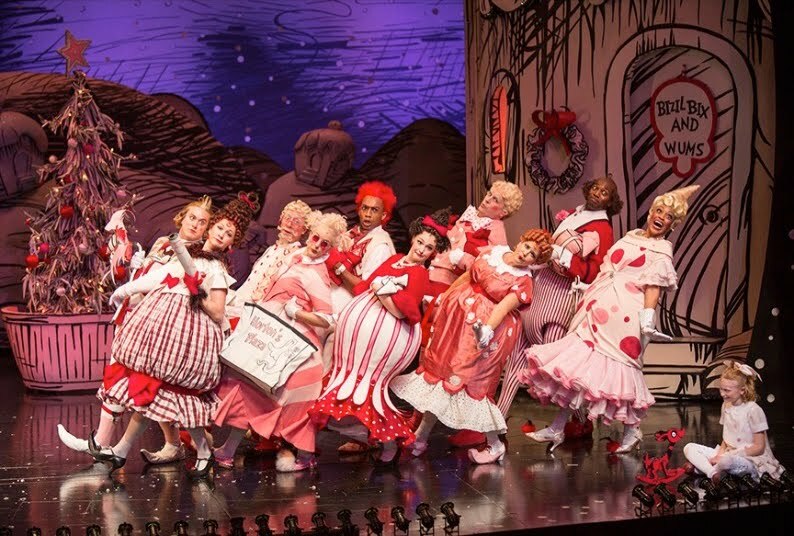 Cast "How The Grinch Stole Christmas"
John Lee Beatty’s set is right out of the Whoville playbook including dancing and singing puppets appearing over the housetops. Robert Morgan costume designes are apropos and comic book looking. From a green furry Grinch to hour -glass and lampshade shaped dresses with outlandish wigs to Who looking costumes for the men, these outfits are unique to say the least. 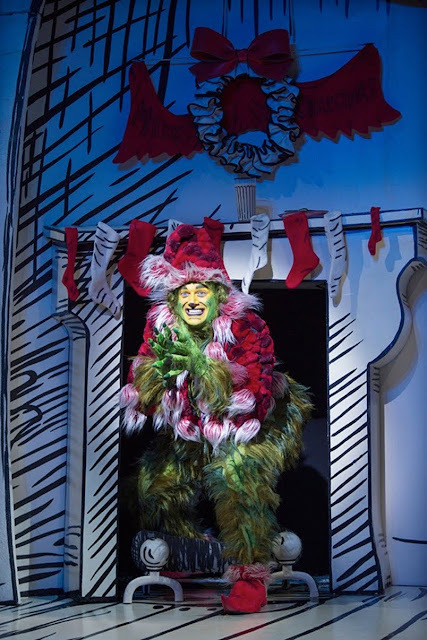 With book and lyrics by Timothy Mason, music by Mel Marvin and original directed by Jack O’Brien, now the job has been turned over to James Vásquez, this “Grinch” has touched hearts and minds for years and if things continue as they are, they will continue no holds barred. Musical director/conductor Elan McMaham and her lively orchestra, Pat Collins lighting design, and Paul Peterson’s sound bring pleasure, once again as the holiday season kicks off with a small army of Whos showing the overzealous mean spirited green Hulk that the human spirit is strong enough to stave off the scariest of characters. I hope you will write often and post more articles.I really appreciate for this great information.Your articles are very useful.I get good feelings everytime I read your posts.